Halloween is here again. Ah, the best time of the year! Out come the witches, the dead rise from their graves, and Jamie Lee Curtis is plucked from the DVD shelf and dusted down to go yet another round with Michael Myers. 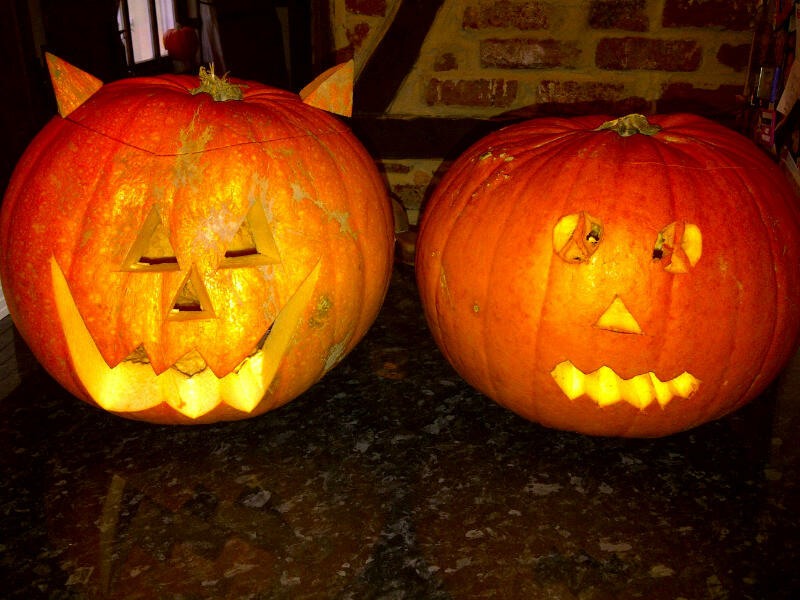 Last night my kids carved their pumpkins (or Jack-O-Lantern’s as my American friends like to call them). Nice, traditional faces – a little different to the pictures I’ve been emailed of late. So, where does the Halloween pumpkin originate from? Well, it dates back to the ancient Celtic religion, when 31st October was the Pagan holiday of Samhain and the official end of summer. The Celts believed that during this time, the realms between the living and the dead were are their weakest, and that the dead were able to rise; appearing as apparitions or in the form of animals including the black cat. The Celts lit bonfires and disguised themselves in costumes hoping to confuse spirits and hence stop them from re-entering. Over the years, this legend has evolved. An Irish myth about a man called ‘Stingy Jack’ who invited the Devil for a drink then refused to pay. He then tricked the Devil into climbing a tree for some fruit. While the Devil was up the tree, Jack carved a ‘cross’ into its bark and thus prevented the Devil from getting down. Jack only let the Devil down after he’d promised not to bother Jack for ten more years. A year or two later, Jack died but God would not allow someone so devious into Heaven. As the Devil was still angry at Jack’s deceit, he too would not take Jack’s soul. So Jack was forced to walk between heaven and hell with only a burning coal inside a carved turnip for light. In the mid-nineteenth century, Irish immigrants fled to America, taking the ‘Stingy Jack’ fable with them. The Americans loved it, and as pumpkins were cheaper than turnips, they soon became the carved tradition we know and love today. So, do you like the Halloween tradition? Do you carve pumpkins? If so, what do your pumpkins look like this year? Add some pictures to my FB page. I’d love to see them! What are the best photos you’ve seen so far? As my lad was born on Halloween (My Ex is definately a Witch) its a double celebration today, I am now frantically carve oranges YES! ORANGES into amusing small Pumpkin replacements as I left it too late to get one! Out of curiosity, what did you name your son? Hi Donna, completely unrelated to Halloween/pumpkins etc! – his name is Morgan. 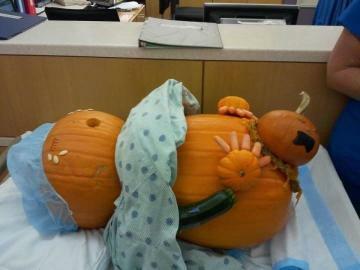 Piper, you need to post some pictures of your hubby’s pumpkins! I knew it was turnips, but I hadn’t heard the story about Jack. Thanks fir enlightening us! I hadn’t heard this story either, until I researched it. Have you ever carved a turnip? We carved pumpkins, had a bunch of daughters friends around, and toured the neighbourhood, where they collected enough candy to keep them wired until spring. Best part was half way round, at Cathy’s house. She has a large front porch and serves hot apple cider in children’s and adult versions. The second half of the neighbourhood went much easier! 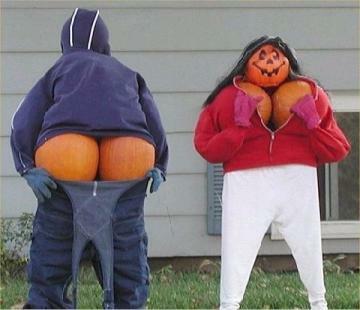 BTW, classy use of pumpkins. Which one’s you? … ouch, ouch! Just, ouch, kidding, ouch. I’m the one with the big bum, lol. The top picture are the pumpkins my kids carved. The others are pictures friends have sent me……..